Summer may have led to a break on the domestic footballing front, but the AFC Heritage Trust has not been kicking its heels on a sun drenched Caribbean beach. 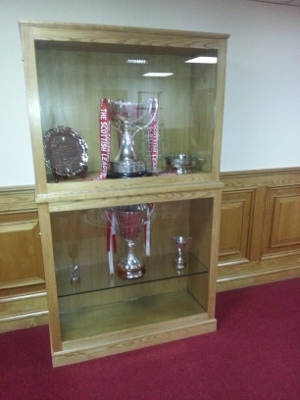 After that wonderful success at ParkRed when the Dandies brought home some significant silverware for the first time in nineteen years, the Trust in partnership with the AFC Former Players Association organised and paid for the construction of a new display cabinet to show off the League Cup to best advantage. The cabinet which was built for us by experienced cabinetmaker Ian Milne of Rubislaw Joinery Services, has been installed in the foyer of the Main Stand and, whilst there is still some artwork to be added, it is already creating a strong impression of what Aberdeen FC is about. Anyone entering the building during the coming season will be unable to avoid seeing this statement of success and ambition. Here's hoping that during the coming season the Dons will be able to extend the stay of the League Cup and maybe add some more silverware that can be proudly displayed in a cabinet that is funded by fans. If you can help the Trust with a donation towards future projects it will very much appreciated. There is a JustGiving button on the www.afcheritage.org home page and if you choose to use it and are a tax payer then the donation will be supplements with GiftAid.